T3 Bayside is comprised of two ten-storey mass timber office buildings with 240,000 square feet of rentable space. The buildings share a landscaped plaza and contain retail at the ground level, second level parking (which can be converted into office space in the future), and easy access to public transportation. Designed by Copenhagen-based 3XN, T3 Bayside will be the ultimate example of a contemporary, professional work environment. 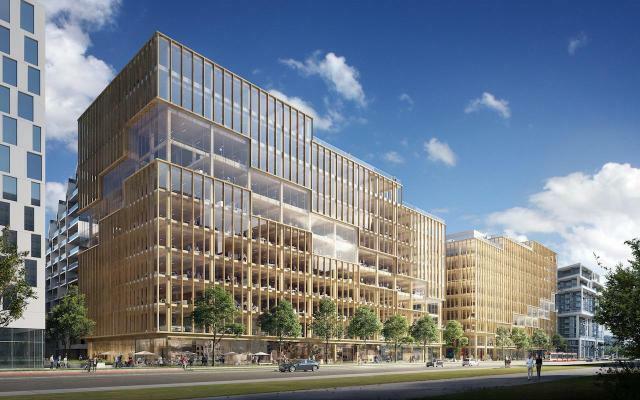 The modern mass timber office buildings will offer light-filled interiors and spectacular city and lake views. T3 Bayside is designed for the current and future needs of the community, with a focus on efficiency and sustainability. T3 Bayside is part of Bayside Toronto, a master-planned community, which includes two million square feet of luxury condominiums, shopping and restaurant destinations, cultural venues and walking promenades along the water's edge. Engineering: The Mitchell Partnership Inc.
Amazon Bid: Mapping Toronto Locations for Tech Giant's "HQ2"